James Croll linked climate change, our planet’s ice ages, and astronomy, proposing that climate change is caused by periodic changes in the amount of energy our planet receives from the sun. With little schooling and entirely self-taught in physics, celestial mechanics, and philosophy, he formulated his visionary ideas and began publishing them while working as a janitor. Croll said the solar energy reaching our planet’s southern and northern hemispheres varies, rising or falling depending on Earth’s location and orientation in space versus the sun. Our planet’s ice ages are caused by solar energy variations altering the trade winds, and hence the strength of ocean currents, such as the Gulf Stream, that carry warmth from tropical regions to polar regions. Croll also devised the concept of ice-albedo feedback. Prior to Croll’s work, Karl Schimper and Louis Agassiz claimed Earth had experienced ice ages in the past. They based their claim on evidence they found in rocks and landscapes. Their claims were disputed because they offered no convincing mechanism to explain the cause of ice ages. Croll provided this mechanism, lending credibility to the concept of ice ages. His theory was then forgotten until in the twentieth century Milutin Milankovic revived it in a mathematically more highly developed form. Was the foremost advocate in the 1800s of the idea that climate change is caused by the changing relationship between the earth and the sun. Devised they theory that climate is controlled by solar insolation – the amount of energy reaching the earth from the sun. Linked our planet’s ice ages to solar insolation variations caused by: Earth’s elliptical orbit around the sun (100,000-year cycle); precession of the equinoxes (23,000-year cycle); and axial tilt (41,000-year cycle). Noted how the elliptical shape of Earth’s orbit around the sun varies with time – sometimes the ellipse is more eccentric (elongated). Said ice ages happen when there is a combination of events: the earth’s elliptical orbit around the sun is at its most eccentric and mid-winter takes place when the earth’s orbit is at its farthest point from the sun. These conditions of reduced sunlight result in lower temperatures, leading to a build-up of ice and snow in the oceans and on the ground. Said the build-up of ice redirects the trade winds and hence ocean currents. Warm currents like the Gulf Stream no longer bring heat from the tropics to the colder regions, enhancing the orbital cooling effect, leading to ice ages. Advanced the theory of ice-albedo feedback. This says that if ice begins accumulating at a pole because of a decrease in winter sunlight, then the extra ice will reflect more of the sun’s heat back into space, leading to further cooling. He (incorrectly) said ice ages alternate between the northern and southern hemispheres – the north and south taking it in turns to have moderate climates and ice climates in a cycle lasting 22,000 years in each hemisphere, with each ice age lasting about 10,000 years. Although today we know Croll did not get all the details correct, his work provided a mechanism that explained the ice ages. It provided a basis for Milutin Milankovi&cacute; to go further the following century and generate the concept of Milankovitch cycles. James Croll’s graph of calculated changes in the eccentricity of the earth’s orbit. The graph shows three million years before 1800 AD and one million years beyond it. In 1830, Sir John Herschel said geological climate could be influenced by changes in the eccentricity of our planet’s orbit, acting to lessen or enhance the difference of summer and winter temperatures. He then concluded the effect would be minimal. In 1840, Karl Schimper and Louis Agassiz provided evidence that landscapes in Europe and North America have been fashioned by enormous ice sheets sweeping down from the mountains. Their claim was disputed because no mechanism could explain it. 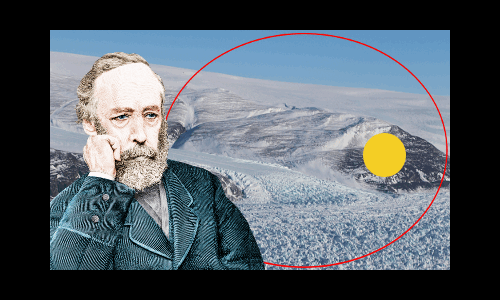 In 1842, Joseph Adhémar linked ice ages to the earth’s elliptical orbit around the sun. He said glaciation spreads when the earth’s elliptical orbit around the sun is at its most eccentric and mid-winter takes place when the earth’s orbit is at its farthest point from the sun. In the 1860s and 1870s, Croll said reduced solar radiation rather than the length of the winter caused ice ages. In the 1930s, Milutin Milankovi&cacute; built on Croll’s ideas and developed Wladimir Köppen’s argument that it is reduced solar radiation during northern hemisphere summers that leads to ice ages. It is in cold summers that snow and ice can persist all year long and begin building up into an ice sheet. The theory Milankovi&cacute; developed is believed to be correct by today’s climate scientists. James Croll was born on Jan 2, 1821 in the village of Little Whitefield, Perthshire, Scotland, UK. James was the second of four sons. His parents, David Croll and Janet Ellis, were crofters – homesteaders on 20 acres of rented land. His father also worked as a stonemason. James’s youngest brother died in infancy. His eldest brother died when James was eight. A childhood accident left his remaining brother hunchbacked. Ill-health meant James did not attend school in his younger years. He then began sometimes attending the village and parish schools. At age 11, reading an article in Penny Magazine made him aware of a world that had previously been unknown to him – the world of science and philosophy. In the following years he read one or two more books on science. He was beginning to value education when, age 14, he had to leave school. His parents needed him to work full time on the croft. In his spare time he devoured any books on science he could get his hands on. At age 16, James Croll wanted to go to university, but his family could not afford it. To make his way in the world, he traveled from job to job, while continuing to educate himself. At age 22, he returned to Perth where, desperate to learn, he went to school and sat learning in an algebra class of children. He then started working and traveling in Scotland and England again. As he grew older, his main interests were physics and philosophy. Often he left jobs when his health failed – he worked as a millwright, a joiner, a tea merchant, and insurance salesman. Like his parents, Croll was a devout member of the Congregationalist Church. He was opposed to alcohol, which led him to work as an innkeeper at a temperance inn and a reporter for a temperance weekly newspaper the Commonwealth. In 1857, at age 36, he published his first book, a religious work: Philosophy of Theism. Two years later he became janitor of Anderson College in Glasgow. The college had an excellent library. For the first time in his life Croll had access to academic books, and he made full use of it. Soon he was writing serious scientific papers. In 1864, age 43, Croll wrote On the Physical Cause of the Change of Climate During Glacial Epochs, looking at the effects of the eccentricity of the earth’s orbit on ice ages. The book made his name well-known in scientific circles. In 1867, Croll accepted a job in Edinburgh as secretary and accountant to the Scottish Geological Survey. In 1875, age 54, Croll wrote his major book Climate and Time. In 1876, he was elected a fellow of the Royal Society and an Honorary Member of the New York Academy of Sciences. The University of St Andrews awarded him an honorary degree. In 1880, after suffering ill-health for many years, Croll retired at age 59. His pension was small, and he and his wife had to move into cheap lodgings. After five years of Croll unsuccessfully applying for a better pension, his scientific friends raised money to allow him and his wife to move into a more comfortable house in Perth in 1886. Despite retiring, Croll continued writing, publishing Discussions on Climate and Cosmology in 1886, Stellar Evolution and its Relations to Geologic Time in 1889, and The Philosophical Basis of Evolution in 1890. At age 27, in 1848, Croll married Isabella Macdonald. A devoted couple, they were both quiet and shy. They had no children. James Croll died on December 15, 1890, age 69, from heart disease at home in Perth. "James Croll." Famous Scientists. famousscientists.org. 31 Mar. 2018. Web.